Yes sir, it is official. 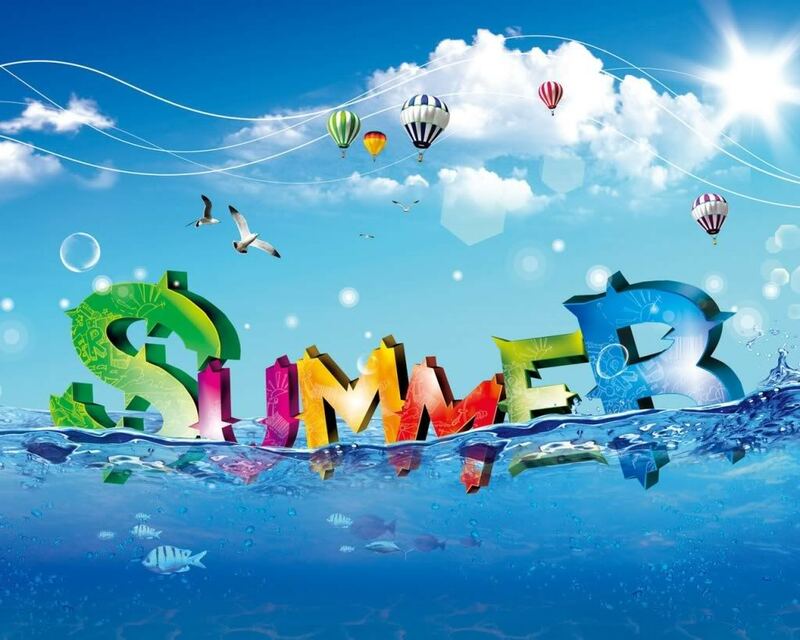 Summer is here and Lone Star Yogi is about to become busy, busy, busy. 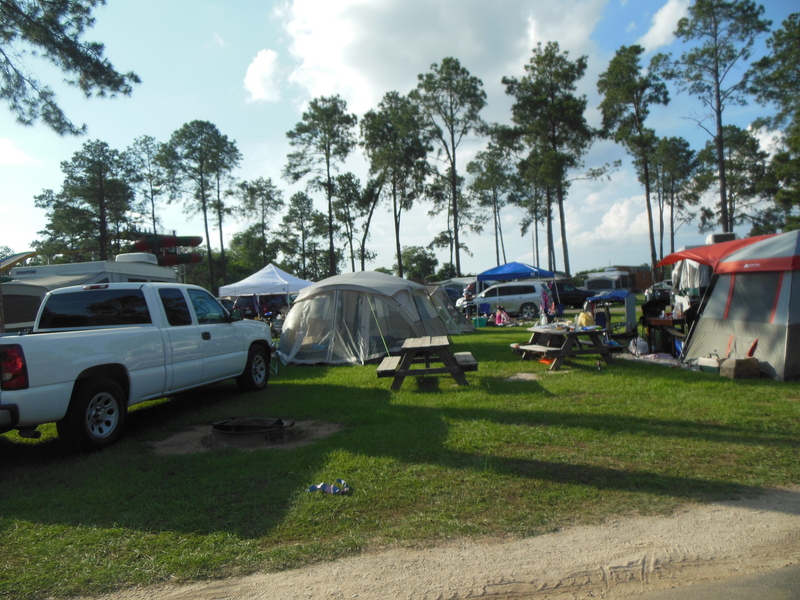 For most destination RV parks, the busy season runs from Memorial Day weekend to Labor Day weekend. Kids are out of school and families are ready for vacation. 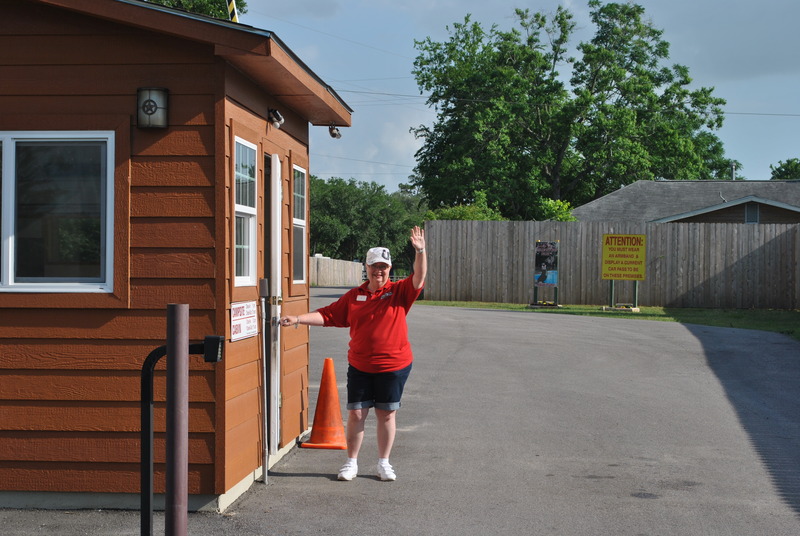 Carol has had a great experience working in the registration office and working at the gate on weekends. By the time she gets home after a day on the gate, Carol is wiped out. She is on her feet pretty much all day. During the week, she takes reservations over the phone and preps the camper’s info packets for the coming weekend. 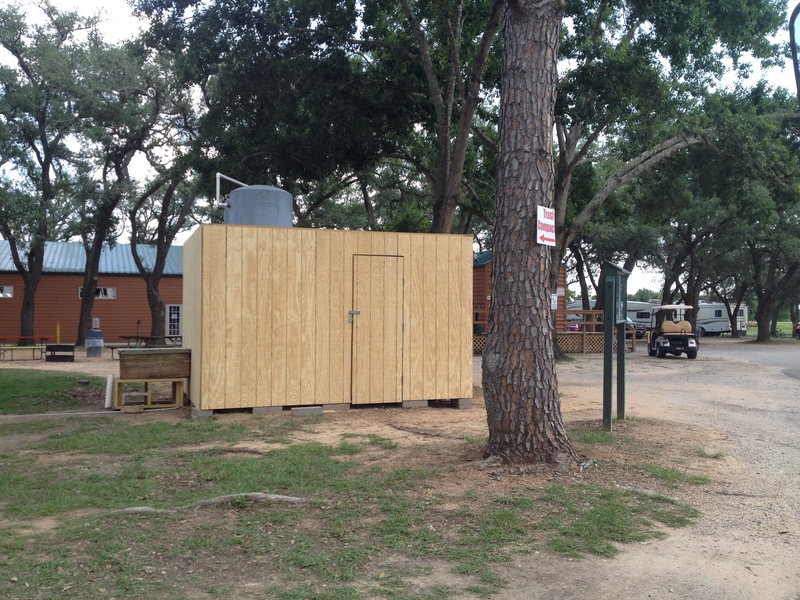 Meanwhile, the construction projects (two housekeeping storage buildings and a new shell for the well house) that Robbie and I are working on are getting closer to completion. 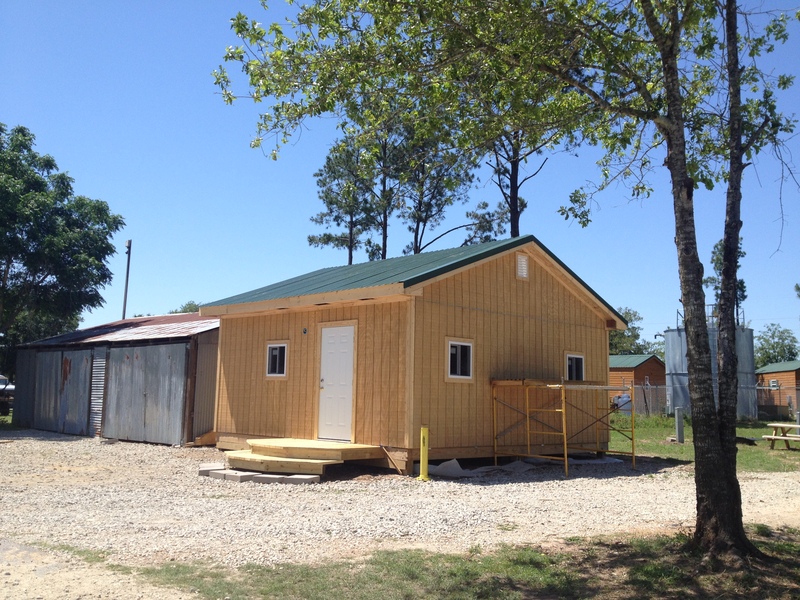 Two things are extremely important when building structures – the exterior walls should be painted as quickly as possible to protect the exterior T-111 plywood panels and the roof should go on as soon as possible once the walls are up. Well, the roof material was two weeks late getting to us so the roof did not go on until after we encounter a major storm. This resulted in finding about an inch of water covering the floor. That was not a good thing. 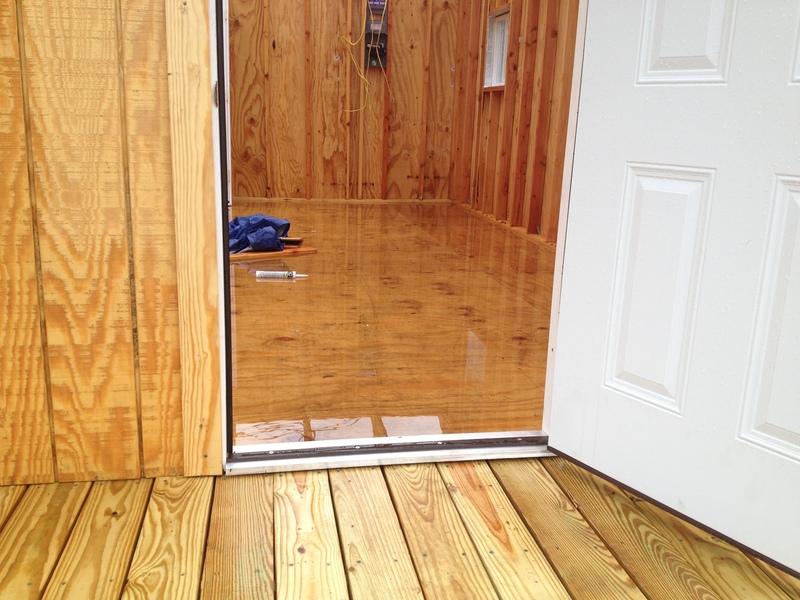 Fortunately the water did not cause any major floor damage. 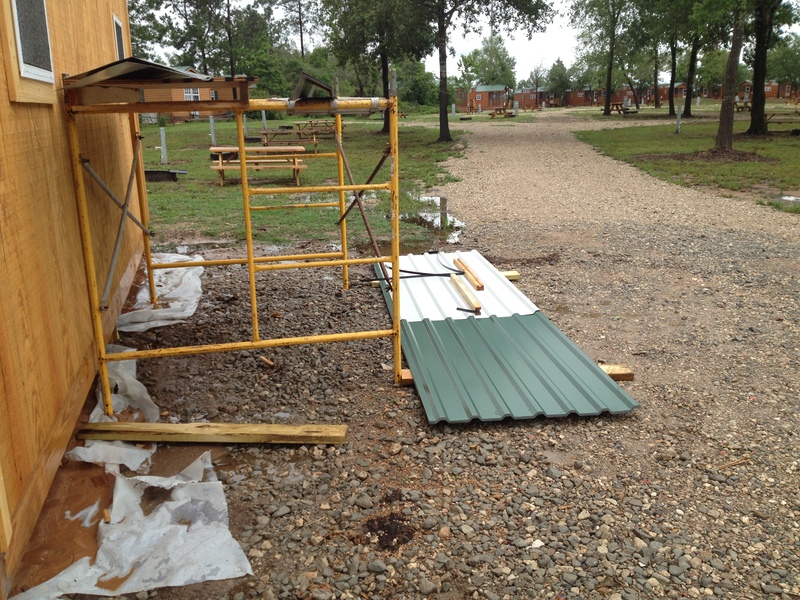 A couple of days after the storm, we received the roof material. So it goes in the construction business. Meanwhile we began tearing down the walls on the well house and raised a new frame. After much discussion about roofing the well house, moving the well house, covering or not covering the well house tanks, we finally got the exterior walls up. 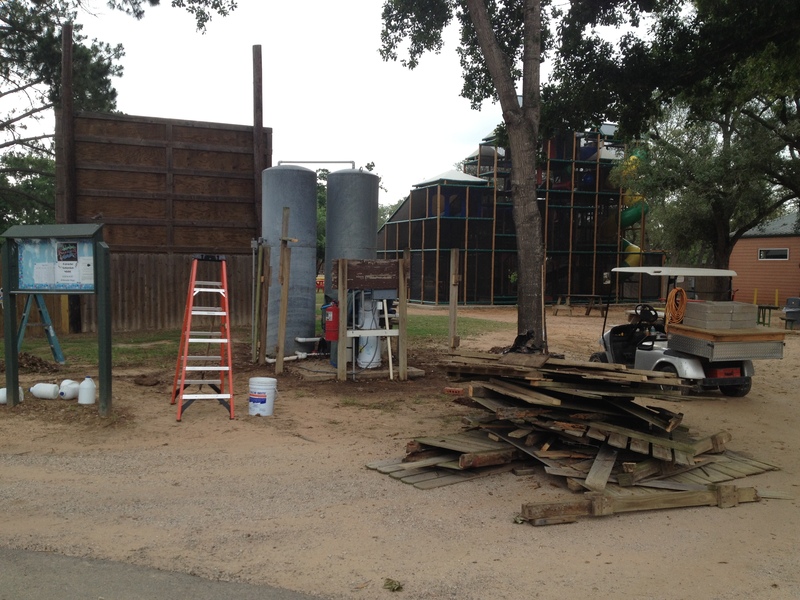 Now there are two structures waiting for paint. Where are the painters when you need them? Meanwhile the first housekeeping storage building finally got its roof, which means we were able to get the ceiling and insulation in place. 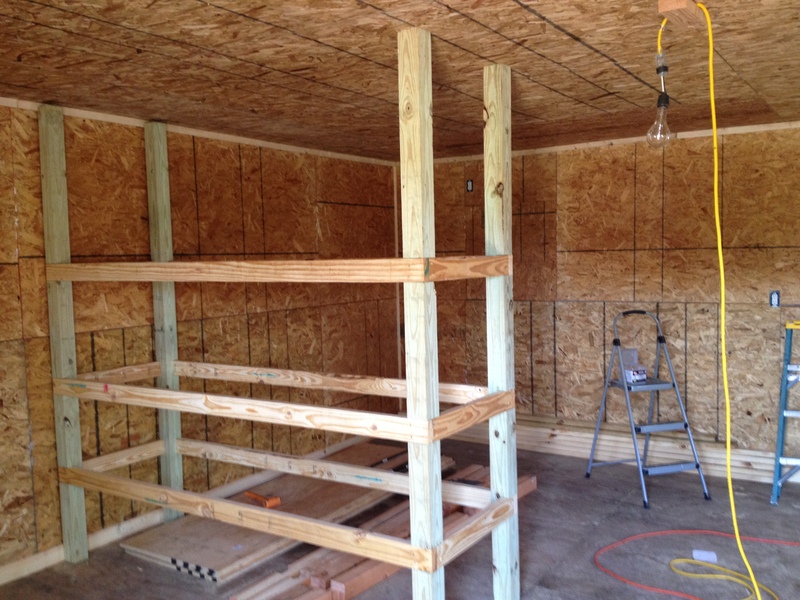 And we finished the interior walls, plus added four large shelving units. Did I mention we had rain while this was going on? 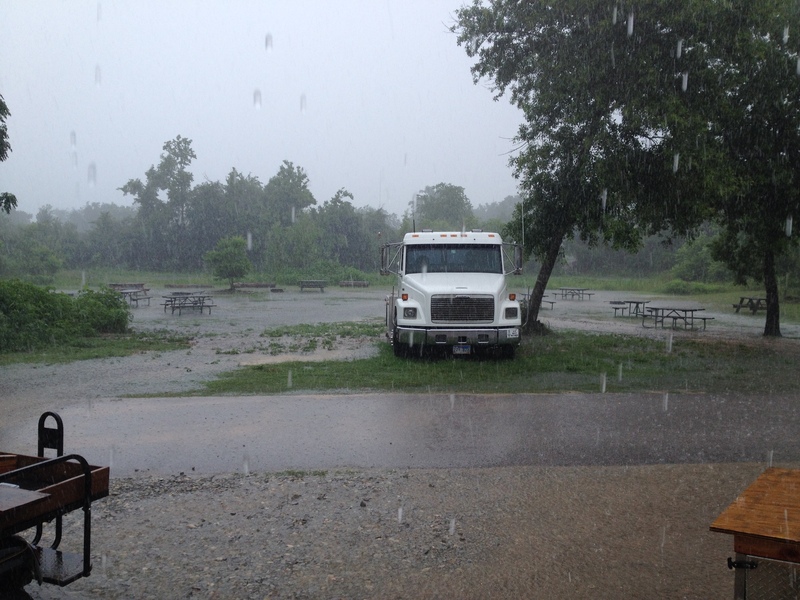 Fortunate for our campers, the rain started late Monday of Memorial Day weekend. Campers where already set to depart so most got out before the big rain. 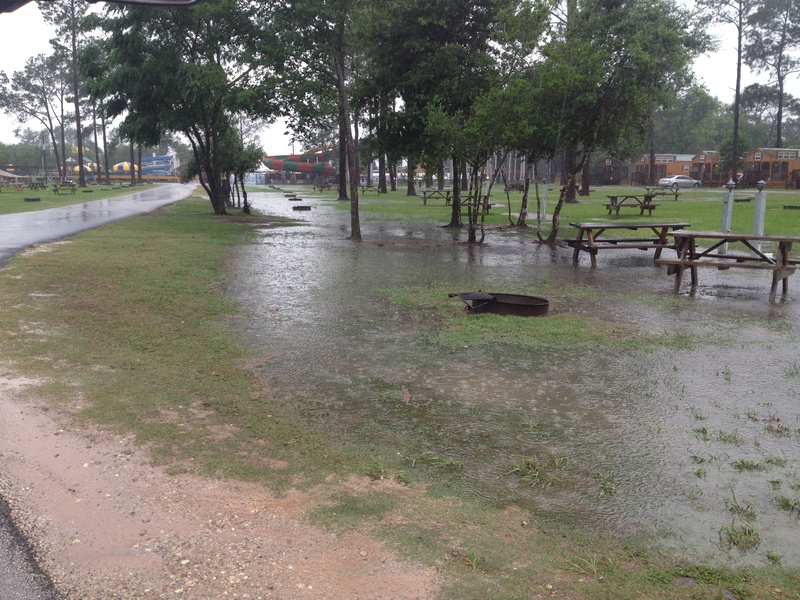 Here is what the tent camping area next to the pool looked like by Tuesday after Memorial Day. Even the group camping looked more like a lake. That’s Robbie’s truck in the photo. 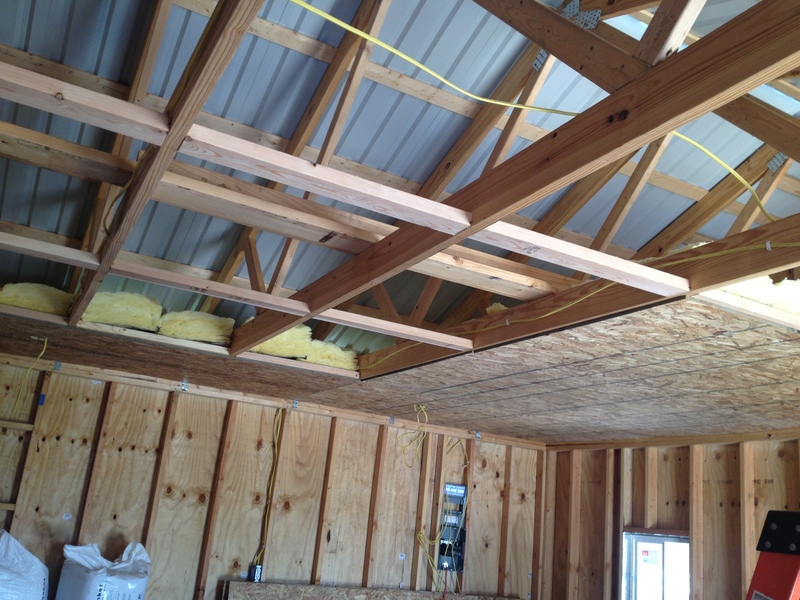 We finally got the roof on the first building and have turned it over to housekeeping. The exterior is still not painted. Hopefully that will change before the exterior T-111 plywood is damaged. 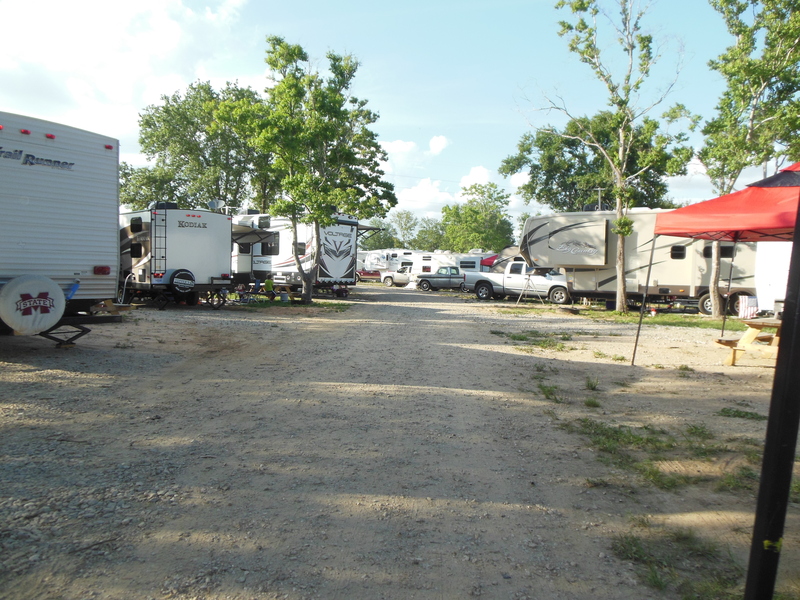 Things are drying out, campers are coming in droves which means summer has officially started. 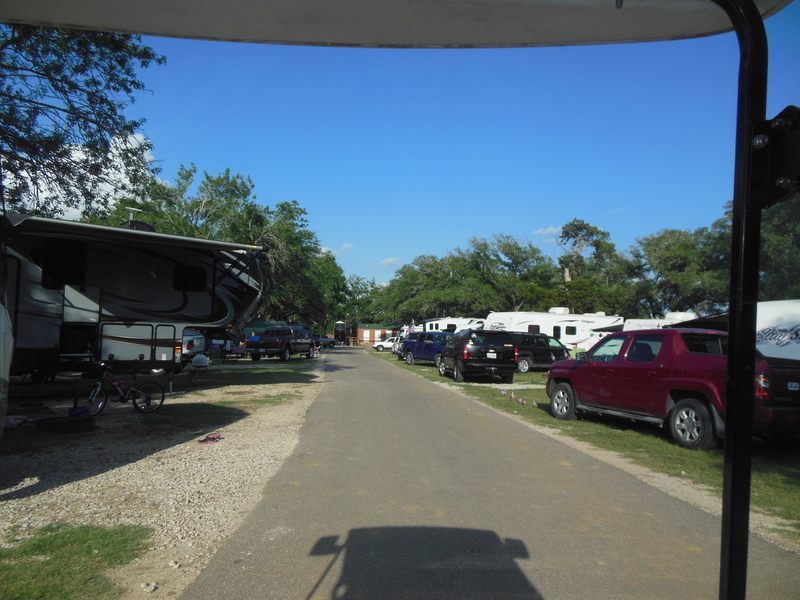 Here are some photos of what this place looks like when it is full of campers. Meanwhile, we have already planted the support posts for the second building and are ready to start on it next week. In about 4-5 weeks, our work here will be completed; we will then have a decision to make about where we will go next. 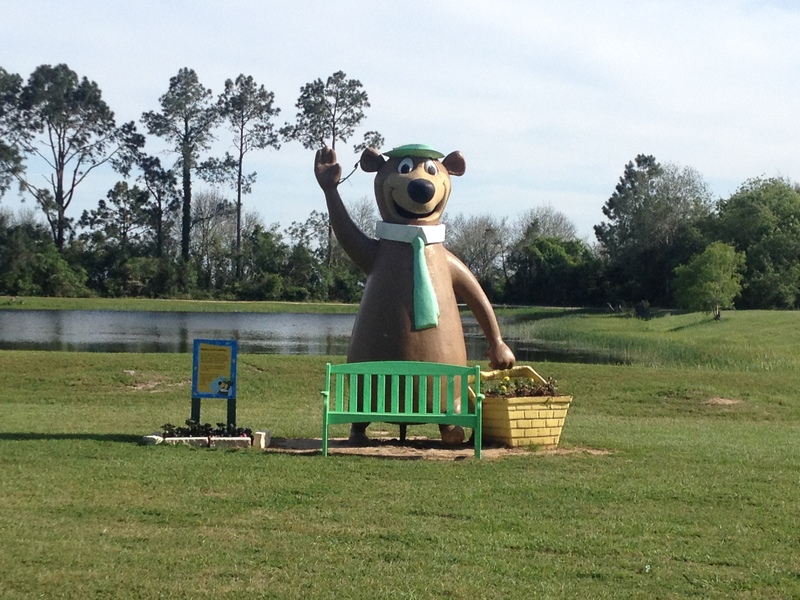 Yogi Bear bids you farewell for now. Thanks for stopping by; y’all come back now.